Here is a bit about hugelkulture taken from this page on permies.com, please go to that page to see a lot more pictures. My intent with publishing this is not plagiarism, it’s spreading the word about really cool things that work, don’t cost anything, and make our world a better place. And of course giving credit to the original author of this page. 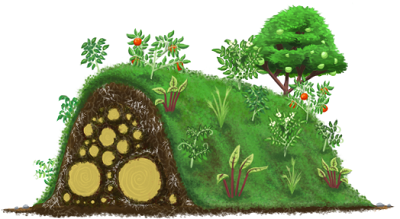 Hugelkultur is nothing more than making raised garden beds filled with rotten wood. This makes for raised garden beds loaded with organicmaterial, nutrients, air pockets for the roots of what you plant, etc. As the years pass, the deep soil of your raised garden bed becomes incredibly rich and loaded with soil life. 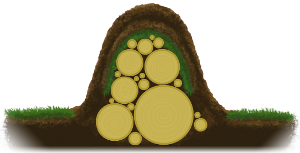 As the wood shrinks, it makes more tiny air pockets – so your hugelkultur becomes sort of self tilling. The first few years, the composting process will slightly warm your soil giving you a slightly longer growing season. The woody matter helps to keep nutrient excess from passing into the ground water – and then refeeding that to your garden plants later. 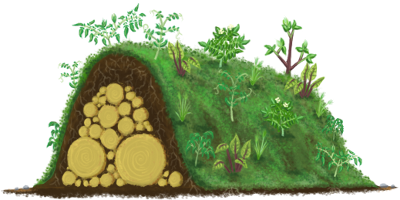 Plus, by holding SO much water, hugelkultur could be part of a system for growing garden crops in the desert with no irrigation. I do think there are some considerations to keep in mind. For example, I don’t think I would use cedar. 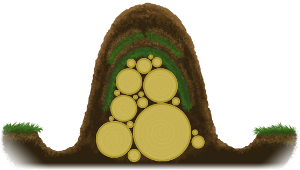 Cedar lasts so long because it is loaded with natural pesticides/herbicides/anti-fungal/anti-microbial (remember, good soil has lots of fungal and microbial stuff). Not a good mix fortomatoes or melons, eh? Black locust, black cherry, black walnut? These woods have issues. Black locust won’t rot – I think because it is so dense. Black walnut is very toxic to most plants, and cherry is toxic to animals, but it might be okay when it rots – but I wouldn’t use it until I had done the research. Known excellent woods are: alders, apple, cottonwood, poplar, willow (dry) and birch. I suspect maples would be really good too, but am not certain. Super rotten wood is better than slightly aged wood. The best woods are even better when they have been cut the same day (this allows you to “seed” the wood with your choice of fungus – shitake mushrooms perhaps?). In the drawings at right, the artist is trying to show that while the wood decomposes and shrinks, the leaves, duff and accumulating organic matter from above will take it’s place. The artist is showing the new organic matter as a dark green. I find I most often build hugelkultur in places where the soil is shallow. So I end up finding excess soil from somewhere else on the property and piling it on some logs. Presto! Instant raised garden beds! This is usually the easiest/fastest way too. Especially if you have earth moving equipment. For those times that the soil is deep and you are moving the soil by hand, I like to dig up the sod and dig down a foot or two. Then pile in the wood. Then put the sod on top of the wood, upside-down. Then pile the topsoil on top of that. Even better is to figure out where the paths will be, and dig down there too. 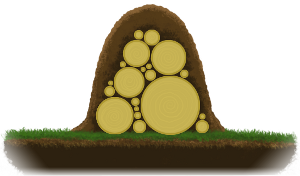 Add two layers of sod onto the logs and then the double topsoil. I have discovered that a lot of people are uncomfortable with the idea of raised bed gardens. They have seen the large flat gardens for years and are sure this is the way to do it. Some people are okay with raised beds that are three to six inches tall – they consider anything taller than that unsightly. So this is gonna sound crazy, but I hope to convince you that the crazy-sounding stuff is worth it. If you build your hugelkultur raised garden beds tall enough, you won’t have to irrigate. At all (after the second year). No hoses. No drip system. Anything shorter won’t require as much irrigation – so there is still some benefit. Imagine going on vacation in the summer without having to hire somebody to kill water your garden! As a further bonus, the flavor of everything you grow will be far better! To go all summer long without a drop of rain, you need to build your hugelkultur raised bed gardens …. six feet tall. But they’ll shrink! Mostly in the first month. Which is why I suggest you actually build them seven feet tall. Hugelkultur raised garden beds can be built just two feet tall and will hold moisture for about three weeks. Not quite as good, but more within the comfort zone of many people – including urban neighbors. Some people will start out with hugelkultur raised garden beds that are two and a half feet tall and plant only annuals. And each year they will build the size of the bed a foot. So that after a few years, they will have the bigger beds and the neighbors never really noticed. And if they’ve tasted what comes from it – they might be all for it without caring about the big mounds. Besides, isn’t this much better use of the wood than hauling it to the dump, or chipping it, or putting it in those big city bins for yard waste? 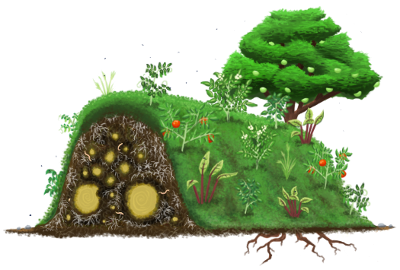 I usually build hugelkulture raised garden beds about five feet wide. This makes for some mighty steep beds. Just pack that soil on tight and plant it with a mix of heavy rooted plants to hold it all together. Quick! Before it rains! If you are going to build beds shorter than three feet tall, I suggest that you make the beds no wider than four feet wide. Unless you are doing keyhole style raised garden beds, in which case you should be able to get away with something wider.